This year, during a festive ceremony on 17 June, Gebrüder Kemper GmbH from Olpe/Germany, MWS from Kufstein/Austria as well as the Swiss company Georg Fischer Automotive from Schaffhausen were awarded by Joachim Schäfer, Managing Director of Messe Düsseldorf. They were honoured for the most innovative and the most outstanding cast products of the industry. The first prize in the category „Best Substitution of Another Production Process“ was won by Georg Fischer Automotive. Martin Guthoff from the company's Technical Product Management and Dr. Martin A. Stehle, Sales Director, were given an award for the development of a console for cab mounting in commercial vehicles. The component, which is manufactured in an iron sand casting procedure, is produced at the company's automotive casting location in Singen, Germany. The award-winning component from GF is 13% lighter than its predecessor, which was made of forged steel. In addition, due to its high functional integration and ease of installation it also offers a saving on costs, thus showing the advantage of casting compared to other production processes. Development began with intensive material development and a targeted analysis of the characteristics of the SIBODUR material. Together with the customer, important milestones were crossed with the validation of the design in the simulation and the testing of the component in the trial. The positive result of the vehicle crash test confirms the success of the project work. Together, a diverse team made up of staff of the customer as well as of Georg Fischer from Singen and from Schaffhausen pursued one objective, fought for it and won. Passing all the tests and gaining approval for series delivery are the reward for the team's work and dedication. Dr. Martin Stehle, Head of Sales at GF in Singen, accepted the award. He said: "We are very pleased to receive this award. Through this team effort, we have shown that components such as this represent the future in casting. Close cooperation with the customer, target-orientated team work and technical expertise in development and production open up to us new segments and new product groups for iron casting." For Kemper, Head of Sales Thomas Funke and development engineer Sebastian Ruhland accepted the award for the „Cast Component with the Best Functional Integration“ from host Arne Birken. The award was granted for the connecting piece "Aqa Perla Professional", which is manufactured in a sand casting process. Aqa Perla is used in the construction trade and in drinking water treatment. The complex design task was to accomplish the intake of functional units for mixing and measuring/counting as well as for sampling and for backflow prevention simultaneously in one connecting piece. KEMPER's outstanding accomplishment of this task was confirmed by the panel with the award. In collaboration with the customer, the KEMPER research and development department creates a process-optimised solution, from the 3D-CAD design to the completed system solution. Here, computer aided manufacturing is the catchword. It ensures safety in the production process. 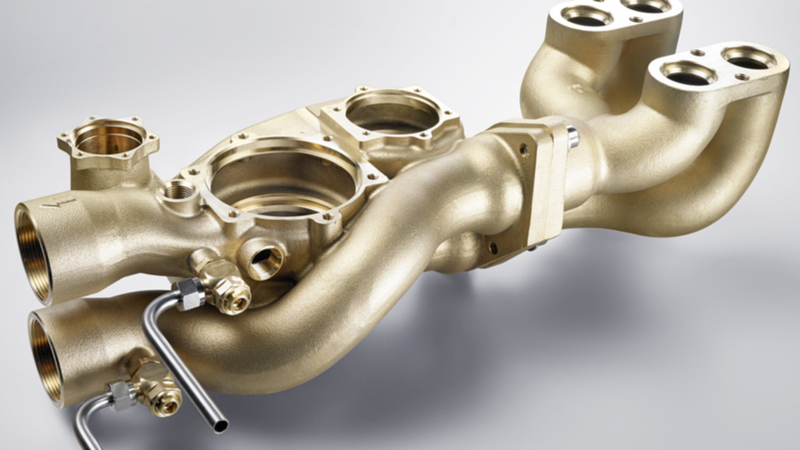 The computer-supported casting simulation supports a quality-assured, environment-protecting and resource-protecting casting process. At the modern sand casting house, 2,500 different components are cast for several hundred customers in Germany and abroad. KEMPER is a specialist and a trend setter in weight-optimised, streamlined cast components, innovative material developments and environmentally friendly production processes. Each year, KEMPER processes 3,300 tonnes of cast material into jobbing casting and fittings. Sand cores for approximately 7.5 million cast components are produced by means of fully automatic core manufacturing processes every year. Finally, the award for the "Best Casting Technology Solution, Expanding the Limits of Casting Technology" went to MWS. CEO Josef Stiegler and head of sales and marketing Hans Zeller received the award for the development of a carrier module manufactured in an aluminium sand casting process and used in vehicle construction. The company invested in its own production line along with processing systems at the Friedrichshafen location for this cell module carrier. The company was represented at NEWCAST in June 2015 with various exhibits, presenting its capacity in aspects from the development and production of aluminium sand and die-cast components to the delivery of complete systems ready for integration to a large number of interested professional visitors. Therefore, Managing Director Josef Stiegler is not only pleased about the award, but also has an extremely positive view of how the trade fair went: "The award for the "best casting technology solution" among the many hundreds of exhibitors underlines the special standards of development and technology that MWS sets itself as the largest sand casting company in Europe: Namely, to find the very best solution for our customers."